Jill's front door wreaths are delightful! Jill is the author of Create Craft Love and she is a very creative crafter. The wreath ideas she is sharing with us are fresh, easy and charming. 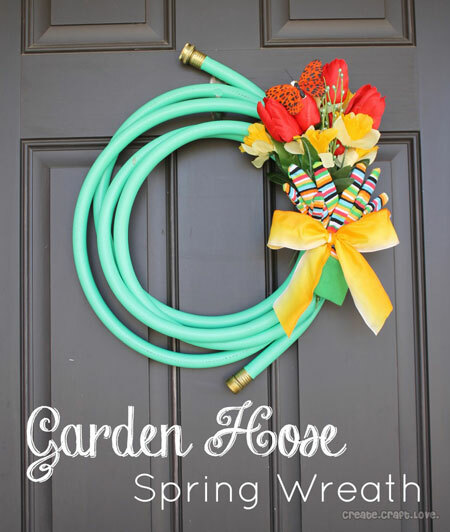 Jill's garden hose wreath - it's a perfect craft to add to your spring decorating ideas. If you are looking for something especially easy to make yet totally charming for your front door this spring, then you are going to love this. 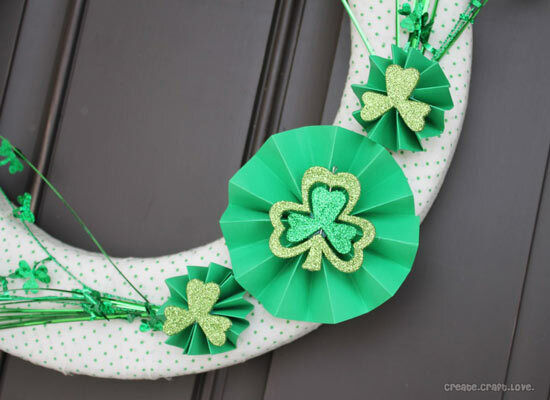 And as a bonus, she also is sharing her St. Patricks Day wreath idea, with us, too. Dave and I would be so happy to hang either of these on our front porch! Isn't this so cute? With just a few simple materials, Jill's wreath shouts "spring"! Who would have guessed a garden hose could look so great on a front door? That is what I love about it - it's a twist on the traditional springtime wreaths. Perfect for your front porch. When I saw this wreath for the first time, I knew it would be a wreath that we will make for our new home. We already bought our garden hose. Just pop on over to Jill's website Create Craft Love to see the full tutorial - and we promise it's fun and easy to make. We are happy to share another of Jill's front door wreaths. This one for St. Patrick's Day. Jill made this stunning St. Patrick's Day wreath using a foam base, seasonal fabric and embellishments. 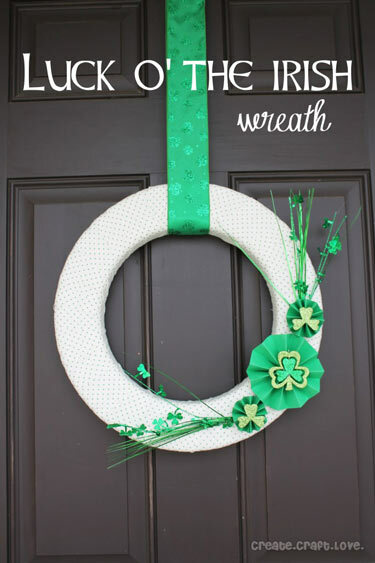 We like her hand-made medallions and the sparkly shamrock decorations she used to decorate her wreath. You can see how she crafted the medallions and completed this wreath on her blog. We are very appreciative to share Jill's front door wreath ideas with you. Jill's blog, Create Craft Love, is a haven of seasonal crafts that are easy to follow and beautifully illustrated. 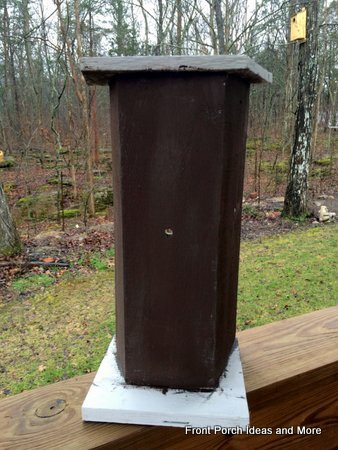 Dave built this decorative bird house from a couple fence slats. Super on-the-cheap. 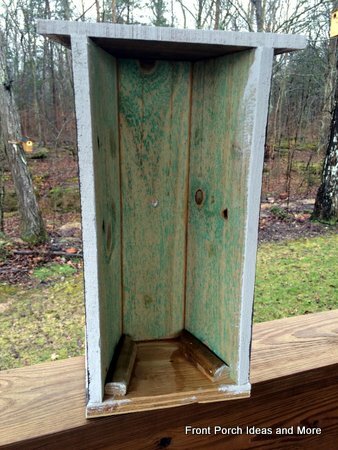 I decorated it with paint and then added the perch and "bird hole" barnwood. I painted the house with a base color choosing dark blue as we already had that paint. I free-hand painted the sides with a vine. I simply searched for a vine pattern on-line and did something along those lines using acrylic paints. I used a stencil for the front and incorporated the same palette of colors as I used on the sides. Then Dave glued on the barnwood "bird hole" covers he had made. I painted the "holes" black. Lastly Dave glued on the perches (i.e. dowels). A couple pictures before we did the decorative painting. The back of it is open since it's just for show. 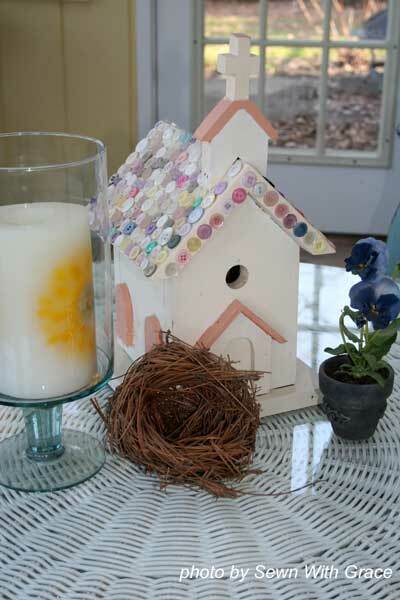 If you keep this decorative bird house on your porch, you could put a brick or rock on the inside to keep the wind from blowing it. Like Jill's front door wreath project, Renee of Sewn With Grace shows us easy decorating ideas for a three season porch. 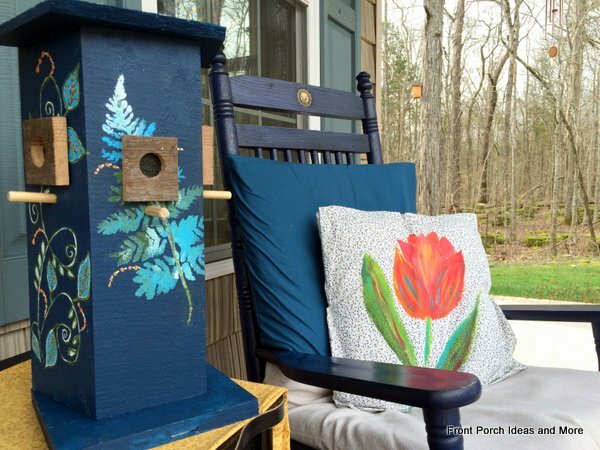 By using a combination of soft colors integrated among comfortable and whimsical items, Renee's porch is transformed into a beautiful respite. Renee says her porch is a work-in-progress. The floors are poured concrete and were resurfaced with color and texture to resemble ceramic tiles. 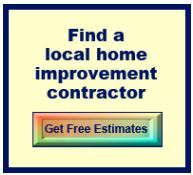 Concrete flooring gives you a variety of options to create a unique look. It is easy to care for and it lasts forever. Renee found this cupboard from a barn sale that she visited. 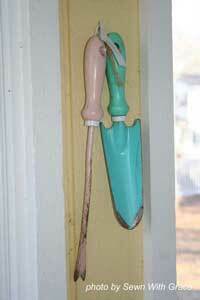 Using items like this is a personable and often inexpensive way to decorate your porch. Of course, a bonus is the built-in storage space. 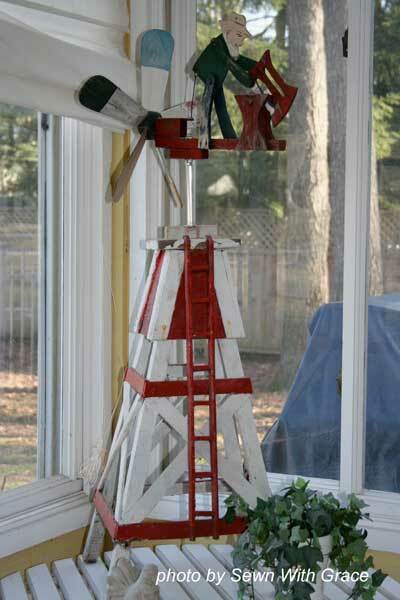 Renee purchased this windmill at her friend's barn sale. 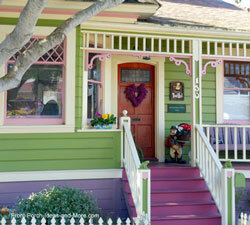 It surely adds a dimension of whimsy to her porch, don't you agree?" 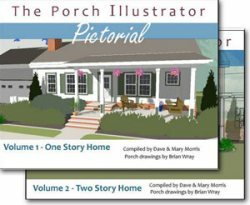 We write about creating a focal point on your porch and this fun piece does just that. 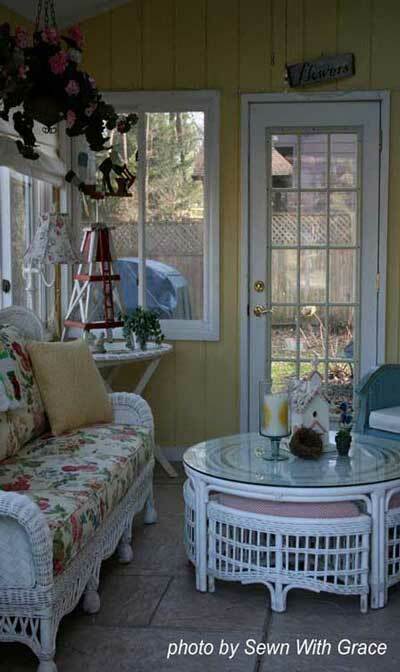 It really works well on Renee's porch and adds contrasting height to the other furniture pieces within the room. 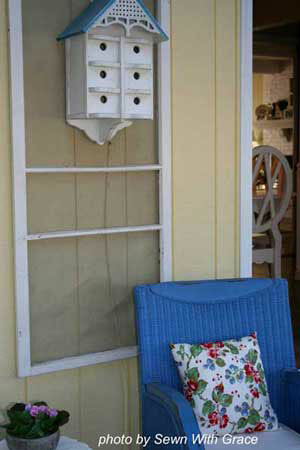 Another fun decorating idea Renee incorporates on her porch is using old screens like the one below adorned with a bird house. Renee enjoys decorating with screens and doors. It's a quick way to solve the issue of a bare wall and adds warmth and texture. 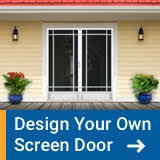 It is common to see screen doors sold at garage sales and salvage yards. Renee found this afghan at an estate sale. 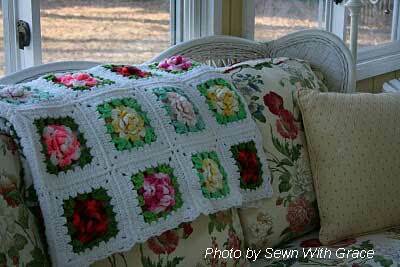 She said that the sweet woman who previously owned it has a fondness for roses and decorated her house in roses. Items of sentimental value, like this beautiful afghan, create a personal, warm feel to Renee's porch. Pink geraniums add color by her windows. 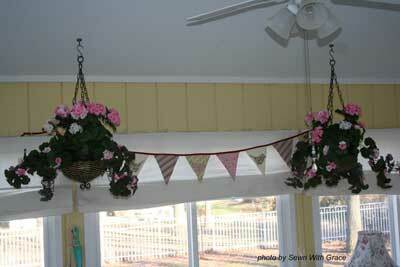 Renee uses silk flowers on the porch so she doesn't have to water live plants over the wicker sofa. Silk flowers look so real you can use them alone or combine them with other plants for added color. A friend of Renee's made the banner; a real nice touch to the porch. 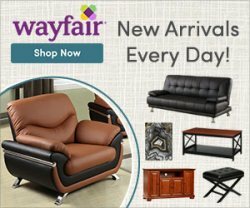 Renee said that she really enjoys her wicker coffee table. The triangular sections come out for additional seating. How fun is that? Renee covered them with a sweet gingham fabric. Plants go great on three season porches. 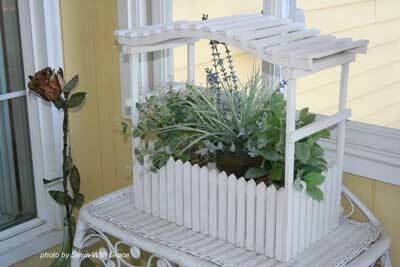 Renee uses this little arbor planter to hold herbs. The iron sculpted rose is from Renee's friend, Joyce, who also made the pretty banner shown above. The wine bottle came from Renee's first job when she was 15 years old. 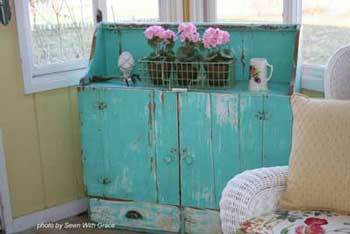 Renee loves incorporating simple everyday objects into her decor by repurposing with paint and TLC. 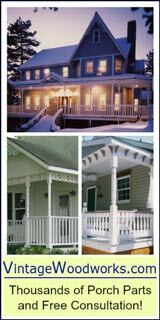 Using objects you already have not only saves money and time but almost always looks great on porches. Old tools, painted in complementary or contrasting colors, an old table covered with colorful material, or old signs like those below. 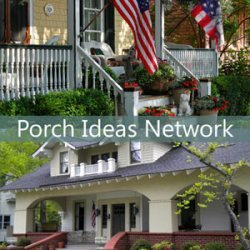 Use your imagination to create easy decorating ideas for your porch! 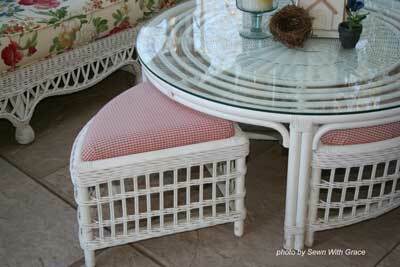 Don't forget to visit Renee's Sewn With Grace, to see more easy decorating ideas for you porch and home. 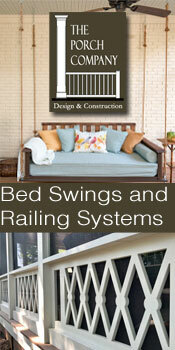 We appreciate her allowing us to show you her beautiful three season porch decorated for spring. 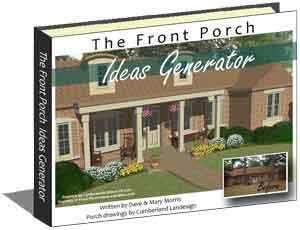 Anita has a porch in the mountains that you will love!